For those that are seriously interested in working out from home and want to make amazing gains, a dumbbell set is an absolutely necessary requirement. However, with conventional free weight dumbbells, the additional weight plates/discs can take up a lot of room. This is especially problematic when you’re living in a less than spacious property. The solution to this is to use an adjustable dumbbell set. The reason for this is that they allow for easy storage since they don’t take up much room. One of the best on the market is from Powerblock, dubbed the ‘Powerblock Elite Dumbbells’ and today we’ll be reviewing these adjustable dumbbells to see if they’re really worth the money. As soon as you unwrap these from the well packaged box, you’ll know that the money you’ve invested in these dumbbells is money well spent. These are actually made in the USA, so there’s not been any corners cut in outsourcing their construction to a cheaper factory in China that would otherwise result in a diminished build quality. In fact, Powerblock are so confident in the build quality of the Elite Dumbbells that they give a ten year warranty for them! This isn’t something which can be said for other dumbbell manufacturers. Whilst Boxflex also make adjustable dumbbells, they sadly don’t offer this kind of warranty to their customers. With the Elite’s, they have a non-slip coating on the handles. This is really is an important aspect in any form of exercise equipment. The reason for this is that you’ll more than likely be sweating when lifting. The last thing you want to do is to drop them on you, especially when they’re heavy! The handles on them aren’t knurled, something which can’t be said for other brands. Some people prefer a knurled grip, but over time this can result in unsightly callouses on the fingers. You’re more than welcome to use training gloves with the Elite’s, but this is necessary. However, it won’t have any detrimental impact on your home workout gains if you do use them. One of the biggest reasons for getting a set of adjustable dumbbells is so that you’re able to quickly change the weights of the dumbbells. Regardless if you’re a serious bodybuilder or a weightlifting enthusiast, you’ll want to quickly change the weight of the dumbbells quickly. The Powerblock dumbbell sets allow you to do this. This isn’t the case with free weights since you need to undo the spinlocks, and then add and remove weight discs. The reason for needing to change the weight is due to the fact that whilst you might be used to heavy lifting, not all body parts will be of the same strength. The shoulder for instance could never support the weights used for chest flys, or other exercises performed on the floor. Therefore, it is important to strengthen these muscles by using a lower weight and building up the strength up over time. This is especially important for shoulder exercises since this joint is prone to damage easily. You could argue that you could purchase a Hex dumbbell set instead since they have a set weight. However, this can result in a larger expense in the long run. These also are exceptionally good at cluttering up the place, meaning you’d also need a rack to store them in. This in itself can be extremely expensive. Thankfully the Powerblock Elite Dumbbells are so easy to change in terms of weight. Some users have reported that they can change the weight of the dumbbells in 6 seconds. Whilst this may be a tad optimistic, it does take less than 20 seconds to do so, and unlike other adjustable dumbbells, the Powerblock Elites don’t require you to push, pull and twist multiple parts of the structure to change the weights when it comes to adjusting them. Normally that in itself is a full workout! As you can imagine, these aren’t the cheapest items of training equipment. However when you think of it as an investment, they’re well worth it. 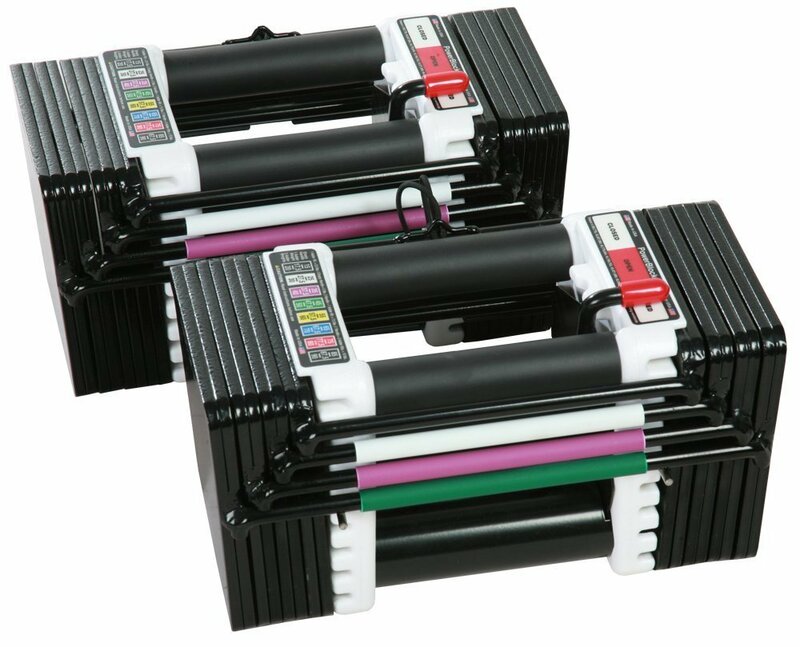 One thing that Powerblock have done is make it so that if you buy the Powerblock Elite 50 set (50 lbs max weight), you’re able to expand them later on to a max weight of 90 lbs. This is something that other manufacturers of adjustable dumbbells simply won’t do. By doing this, you’re able to save money initially since if you’re new to working out, it’s going to take you a while before you can utilise the full potential of the 90lb set. Of course, some people simply go out and buy the full set right away since these weight sets hold their value really well. Sadly, as with any product there are downsides to it. One such example of this is that unlike normal dumbbells, you can’t repurpose the weight discs. By this, we mean that you can’t move the weights from the Powerblock to a barbell instead. In contrast, you can do this with free weights. Having a barbell really is a desirable piece of equipment for your bodybuilding end goals. Thankfully though, these kits aren’t generally that expensive. It is something to think about though when you’re coming up with a budget for your training equipment. Of course, it would also be ideal if you add kettlebells into your workouts. Resistance bands are also a great help to ensure you get a great workout when you’re not at the gym. Whether or not you go for the Elites, the most important thing to remember that for any fitness goals is to make sure you work out safely, and most importantly, have fun. Workout equipment (especially for those working out at home) needs to be treated with respect. These adjustable dumbells help to ensure that you’re working out safely, but it can’t guarantee that no harm will come to you. It is up to you to ensure that any resistance training that you do is within your limits when you’re targeting the various muscle groups when doing a fully body workout. The Powerblock Elite Dumbbells are really a fantastic addition to any home gym, and because of their unique look, they really stand out (in a good way). They aren’t bulky at all, and are a great way to carry out a wide variety of exercises, including bent over rows. These in particular are a great way to pack on muscle mass. They’re an expensive investment, but as the old saying goes; if you buy cheap then you end up buying twice. If you’re looking to purchase these and read all the other amazing reviews about them, you can use this link to read about them on Amazon.